1. Commemorative banknote album (100 Ngultrum denomination) of the Royal Wedding of His Majesty the King Jigme Khesar Namgyel Wangchuck and Her Majesty the Queen Ashi Jetsun Pema Wangchuck. 2. Commemorative banknote album of His Royal Highness Gyalsey Jigme Namgyel Wangchuck’s first birth anniversary. 3. Commemorative silver coin of the 60th birth anniversary of His Majesty the Fourth King Jigme Singye Wangchuck. 4. Commemorative copper-nickel coin of the 25th anniversary of the coronation of the Fourth King Jigme Singye Wangchuck. 5. 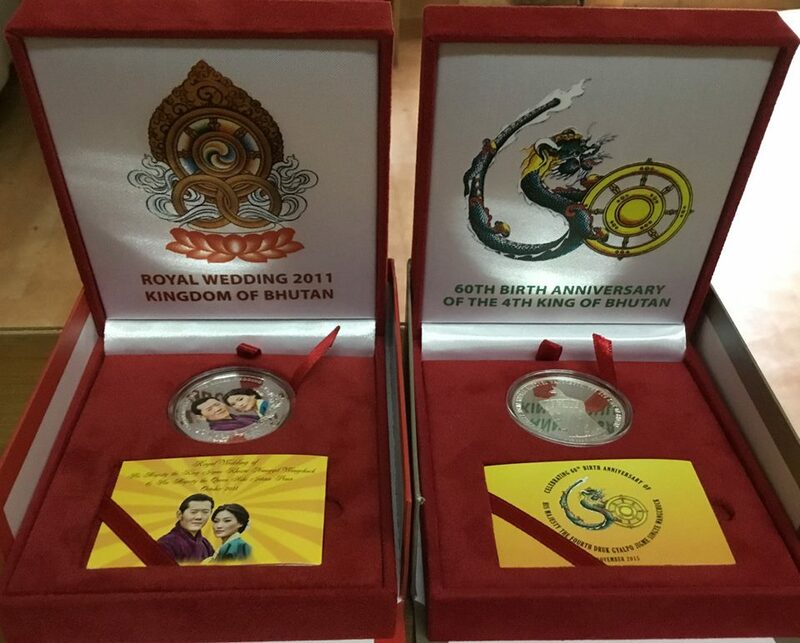 Commemorative silver coin of the Royal Wedding of His Majesty the King Jigme Khesar Namgyel Wangchuck and Her Majesty the Queen Ashi Jetsun Pema Wangchuck.